Hi! This is take two of my try-on post for the March new arrivals. I stopped in to J.Crew earlier this week to check out the newer arrivals and attempt to shake off the funky mood I’d been in. Well. Apparently all moods can’t be cured by trying on clothes because I think I felt worse when I left than when I arrived. Nothing worked. Everything was too.short. Blah blah blah and more blah. Kind of like my mood. Even my photos looked blah. 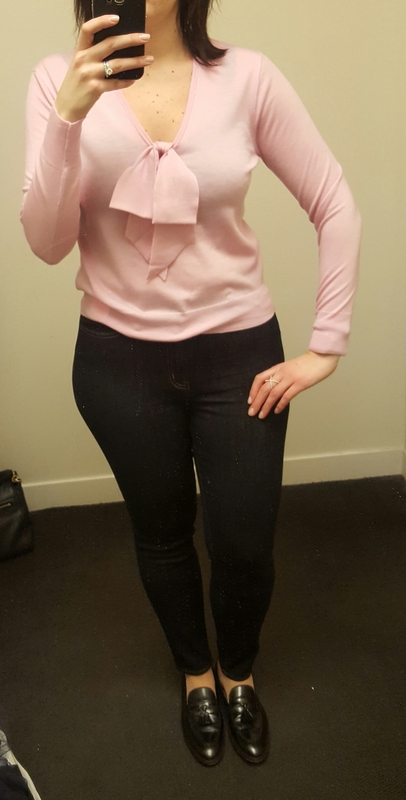 I know I can’t love everything at J.Crew all the time but usually I leave wanting several things and aside from the (smaller size!) of the Lookout Highrise jeans that I came in to buy, I left empty handed. Fast forward a few days, a few days out in the sunshine and I decided to venture back to the mall to try on a few more things. A few hours later, after a few hours with one of my favorite sales associates, I was feeling better and adding things to my wishlist. There’s the girl I know! So…word to the wise. Shopping doesn’t always cure all. If you’re not feeling it, you’re not feeling it. But today, I was feeling it and am looking forward to warmer temperatures and spring wardrobes! I should also probably mention that my sizing is changing a bit as I’ve lost some weight since the beginning of the year so “my usual size” may not be in my vocabulary as much since I’m adjusting to what my size really is these days. First up, the Drake’s® for J.Crew skirt in giraffe print. I probably wouldn’t have tried without the nudging of my SA. I personally haven’t been a huge fan of the Drake’s prints (they’re just not my thing) but I have liked them on others. I’m admittedly not usually a “critter” on my clothes type of person but this skirt surprised me. I’m wearing a size 8 so this skirt definitely runs a little big since I can usually do a 10 in these style skirts. The pleats are flattering and it’s a pull on style with pockets (always a plus!) I liked it a lot with paired with the Always Chambray Shirt (wearing a size 8 – say what?! That’s called a proper fitting bra + eating better) and I would wear it with navy as well. This isn’t an immediate must have but it’s definitely on the list for when the weather gets a little warmer. Next up, the Pop Stripe Dress. My store had one skirt in this print but it was unfortunately a few sizes too small for me, so I went with the dress. I’m wearing a size 10 and it was still on the loose side. With my hips I probably couldn’t have gone down another size so if you’re between sizes I’d definitely go down. It was still loose in the waist and on top – I wish it would have nipped in a little bit more at the waist to give some definition. And like others have lamented, I wish it was silk. I think it’s a pretty print and I would definitely contemplate the skirt on sale but the dress wasn’t quite right for me. I think a lot of people will pull this off though. I would tone it down with a navy (buttoned) cardigan for work. And I wish it was just a smidge longer so the tall version would be a possibility – my guess is an 8T is probably the perfect size for me in this dress. Next up, the Midi Skirt in Fringe Dot. I am admittedly not much of a blue person but I like the easy pull on style of this skirt which makes it work for a more casual office or weekend wear. The dots on the skirt are woven and it has pockets which of course is a win. This also comes in an ivory colorway (marine salt). I’m wearing a 10 in this skirt so I’d say it’s true to size. It also comes in tall which I wouldn’t need. Next up, the Embellished Cotton Jackie Sweater. This sweater was an immediate hit in the gold/rose gold sequin combo. In addition to the periwinkle/melon combination it also comes in heather sand which is a beige/khaki color with the same color sequins. This is definitely a fun cardigan and there is a coordinating striped Jackie shell that goes with it as well. This is a large which I’d want if I wore it buttoned. I tried a medium in my first try-on session and couldn’t button it but it was cute with the striped shell. Next up, the Tie-Waist Skirt in Ornate Floral. This came out in the last rollout but I only tried the Tippi sweater in the print. This skirt hasn’t worked well for me in it’s past few iterations but I thought now that I’m down a few pounds I might try it again. This is a size 12 and it’s still tight in the hips but loose in the waist. 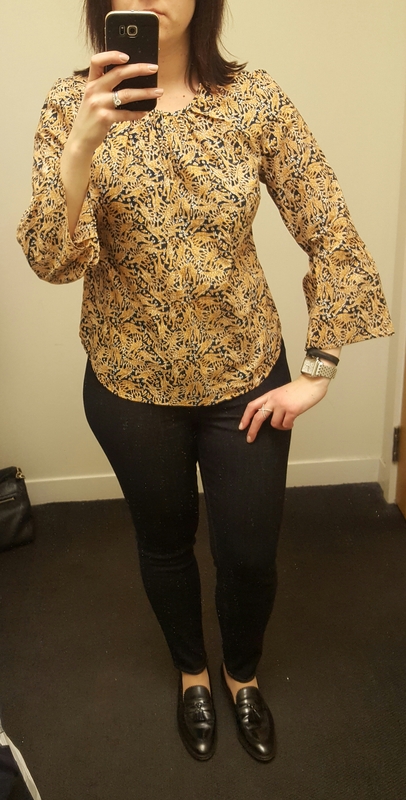 The bow is a bit much in the waist area for me and I would probably do a simpler top with this but this print is growing on me the more I see it on other people. Next up, the Long-Sleeve Chambray Shirt Dress. I tried this on in my earlier try-on session in the medium and it was too small. This is the large and it’s too big. I’d need a belt to make it work and I don’t love it enough to want to make it work. I have the pull on short-sleeve chambray dress from last year so this isn’t a must have for me. I think a lot of people will like the easy style and it is a perfect toss on and go in the late spring/early summer weather and would work with tights and booties as well as with sandals. If you’re curvy like me, you’ll probably need to take your larger size. Next up, the Jackie tie-neck cardigan in stripes. This is the sweater that I mistakenly thought was the striped Tippi on my last visit but alas, it is a cardigan that runs very small and short. This is an XL and while it was a bit roomy through the body, any smaller and it would have (also) been too short. I’m not totally sold on these bows on the sweaters and while I like them on others I haven’t quite gotten there myself. I am also wearing the Lookout High-Rise Jean in Resin Wash in size 31. These jeans are my new favorite! Next up, the Cropped Silk pant in foulard print. What can I say? We all know I’m a sucker for stripes but I’m also a big sucker for a good foulard print. Toss in an elastic waist? Sold. I’m wearing a 12 in these so I’d say they’re true to size. They have a zip/button fly but an elastic waist so they’re not a pull on/pull off. While a little bit of a looser fit they’re still a bit clingy and I’m not sure I could have sized down. I’ve typically been a 12/14 in pants but the waist is always big on me and these are good in the hip/thigh area. I tried them with both the Always Chambray Shirt (size 8) and the Garment-dyed fatigue shirt (I think this was an 8 too). The fatigue shirt wasn’t totally my style but I liked how the lighter color looked with these pants so I’ll be trying a neutral Tippi sweater with these since these pants came home with me. Lastly, let’s not ignore a few of my (sort of) misses from my first try on session. As I’m looking at them again, they weren’t all bad. First up, the Lightweight wool bow sweater. The merino on this sweater is very lightweight and while the photo doesn’t look so bad, it felt incredibly short on me. It is a pretty shade of peppermint pink. The V-neck was lower than I would have liked. I think I might have liked this better in navy – the bow felt floppy to me and overall it was a miss. Next up, the Silk bell-sleeve top. Ok, again, as I’m looking at these photos, I don’t hate it. I did want it to be longer though. I’m wearing high waisted jeans so the shortness isn’t completely apparent. This blouse doesn’t come in a tall length but it does come in petite. I’m wearing a 10 in these photos. I like that it’s silk. It comes in a brighter blue, navy and ivory as well. Edited and added per request! Here’s a look at the Drake’s® for J.Crew bell-sleeve top in giraffe print . The top is the same material as the skirt – it’s a midweight cotton that isn’t flimsy and isn’t crazy heavy either. It’s a perfect cool to warm weather weight and looking at the website photos it would be perfect with white denim. This top is already getting a lot of love in the reviews and although it’s not totally my style I think a lot of people will do it justice. I think the sleeves are just a bit too much for me. I’m wearing a size 10 so I would say it’s true to size. Well, there you have it. Some of the newer arrivals at J.Crew. What are you loving? Would love to hear what you think and thanks for stopping by! And don’t forget, if you live in the Buffalo, NY area, join me on Thursday, February 23 at the Walden Galleria J.Crew for a shopping and styling event. You can see more details here. Thank you so much for all the reviews! I personally think you look absolutely stunning in the lookout dark resin and blue embellished jackie cardi combo!